L. Douglas Keeney is the author of numerous books on American history. In addition, he is a frequent subject matter expert on cable TV and writes occasional op-ed pieces. He holds a Masters degree from the University of Southern California. For 25 years I have met with, interviewed, laughed, drank and cried with the men of our Greatest Generation. I have told their stories in a half-dozen books and shaken hundreds of hands, but the one thing I can't tell you is how to bring them out. How many times have you heard someone say about their uncle or even their husband: "I had no idea he did that!" To a man, World War II is theirs alone, an experience not easily shared with others, not with wives, children, not even with the nurses at the VA hospitals. They went, they fought, they came home, but they saw no glory in it and they want no adulation. "Heroes?" said an incredulous Chuck Yeager as we talked one afternoon: "Hell, no; we just wanted to get home." This year, the Greatest Generation is celebrating the 70th anniversary of their war — 70 years since the D-Day invasion, 70 years ago now for men who are in their 90s. They don't want to be called heroes, but that doesn't mean we shouldn't think about them that way. Let me tell you a story about a young man named Hickey. I don't know his first name or what town he was from, but I do know what Hickey did. He left college and his home and family and joined the Navy. He qualified for flight school, earned his wings as a fighter pilot and was promptly assigned to an aircraft carrier that was sent to the Pacific Theater. It was 1943. He was fighting the Japanese. On Aug. 4, 1944, Lt. Hickey was on a routine combat patrol over the Solomon Islands when his group was boxed in by bad weather. In the grip of this terrible storm, his electrical system burned out, his instruments went dark, he ran out of gas, and he was forced to ditch in the seas below. Hickey somehow survived the violent impact with the water, got clear of his sinking plane and even managed to get into his life raft, but it was getting dark so there was absolutely no hope of a rescue. Resigned to his fate, this 22-year-old hauled in his parachute and covered himself up and shivered through the night on the pitching seas. Dawn came and Hickey spotted land, but it was an occupied island, which meant certain capture. Lucky for him he was picked up by a small platoon of Filipino guerrillas. For the next three weeks, they hacked their way through the jungle, ate what they could, slept where there was a place to hide, until they got Hickey to friendly forces. But at a price. Along the way, Hickey was attacked by an alligator, nearly captured by a Japanese patrol, lost almost 20 pounds, and at the end linked up with a ragtag band of other escaping airmen who needed help blowing up a Japanese railroad bridge on their way out. Under a full moon, Hickey and this team slipped through the undergrowth with a satchel of TNT and a Thompson machine gun, wired the charges, and set off the explosion to a "terrific blast," as he later wrote, and the bridge was gone. Lt. Hickey was rescued by a seaplane and returned to his squadron. He would later learn the bridge he destroyed would have been used by the Japanese to send soldiers forward to oppose Gen. Douglas MacArthur's landings in the Philippines. The day he got back to his squadron he went before his commanding officer emaciated but standing tall and confident. "What can I do for you, Hickey?" his CO asked. "I want a new fighter plane, sir," he said. "I want to get back into the fight." After ditching in the Pacific, weeks of deprivations in snake-infested jungles, and blowing up a bridge, Hickey had every right to go home. But that wasn't the way of it for the Greatest Generation. He wanted to stay and do his part to end the war, and so in the end he couldn't hide his disappointment. "No soap," he said to his buddies after the CO pronounced his decision, and there his war ended, 70 years ago. He was told to go home. Beginning this Memorial Day, countless 70th anniversaries will come and go over countless cups of coffees in towns big and small as one or two gray-haired old men sit with each other in coffee shops. The Greatest Generation is aging, disappearing, slipping into the past, yet each one has a bridge they blew, a close call they survived, a buddy who didn't make it back. No, how do you answer such a question between sips at Starbucks, how do you explain the loss, the friends when someone says, "What did you do during the war?" But each has a remarkable story even close family members don't know. It's fitting therefore, that we set aside one day, Memorial Day, to remember the millions of Lt. Hickeys, be they from World War II, Vietnam, Afghanistan or on active duty today. Thank them, silently if need be. Those memories they can't seem to share are why we have our freedoms today. L. Douglas Keeney is the author of "The Pointblank Directive," about the air war over Europe during World War II, and "Lost in the Pacific," stories of survival during World War II in the Pacific Theater. His next book is about Franklin D. Roosevelt and the World War II Tehran Conference. He found this story of Lt. Hickey from a crash report he retrieved from the World War II archives at United States Air Force History Center at Maxwell Air Force Base. On January 19, 1966, a pair of United Press International reporters picked their way down the rocky hillside towards the village of Palamores, Spain and while turning down a dirt road they came face to face with an engine from the KC-135 tanker. They drove further only to come upon a section of a airplane’s landing gear. They ran into men in yellow coveralls moving through the fields in a line-abreast formation. And with that, they had a story. A B-52 nuclear bomber liked this plunged to the ground in Spain. The white undercoating is to reflect back the heat from a nuclear fireball. That evening the UPI put out a wire story claiming that an American B-52 had exploded over Palamores, Spain and that nuclear bombs had been involved. The Air Force responded with a vaguely worded press release about unarmed nuclear armaments but SAC was a nuclear bombing force and it had gone to great lengths to make that clear to the Soviets if not to the world. Soviet trawlers promptly made their way to Palamores. The Air Force poured men and equipment into Palamores. Search teams moved in line abreast formations across the arid hills. Barrels were filled with sand and topsoil. Helicopters thumped above moving men to and from search sites, often dropping plastic tubes with classified communiqués down to the teams. US Navy ships dotted the horizon. Since Palamores was littered with mine shafts, a detachment of mine experts arrived from the Bureau of Mines in Colorado. Questions poured into the United States State Department, the Embassy, and to the Air Force. As yet, it was only a tragic mid-air collision but there was far too much going on to be explained by the simple removal of wreckage. 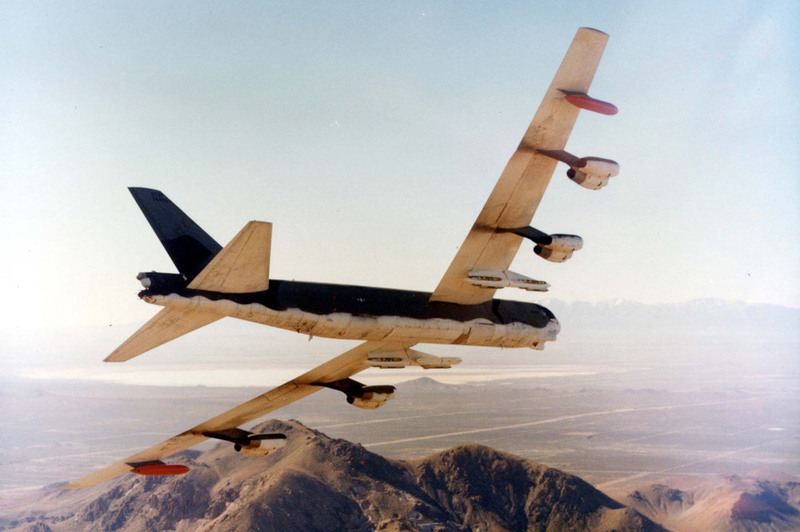 On January 22, 1966, the Air Force reluctantly acknowledged the truth, that nuclear bombs had been onboard the stricken B-52 and that that one of those bombs was missing. The reaction was immediate. Angry Spaniards surrounded the American Embassy in Madrid and protested the presence of nuclear weapons in their skies and now on their soil. American allies offered little consolation: it was well known that SAC had airborne bombers but few knew those bombers were flying over their countries with nuclear bombs on board. A nuclear bomb about this size was found down inside an undersea trench at almost 3,000 feet. The search for the missing bomb continued for three months. Protestors ringed American embassies the world over. Anti-American sentiment poured out in the streets of capitals and violence occasionally erupted. The search turned to the sea but the sea search was hampered by a deep undersea trench. It was not until March 15, 1966 that an experimental submersible named Alvin found the missing H-bomb. Groping through the darkness, the bomb suddenly appeared in the cone of light from the submersibles’ searchlights. It was perched on a ledge on a seventy degree slope 2,850 feet beneath the sea. On April 7, 1966, the bomb was pulled out of the water and laid on the deck of the USS Petrel. The Navy pulled back the tarpaulin. “The world’s eyes may see that the bomb has been found,” said Adm. Wetherby Hill. Cameras snapped the first pictures ever taken of a thermonuclear bomb. The next day, the most secret weapon in America’s arsenal was reproduced on the front pages of newspapers around the world. While technology has certainly evolved dramatically -- we have satellites today instead of LORAN and radar -- the art and science of open water search and rescue dates back to the start of World War II. Almost all of the techniques we have today were developed and refined 70 years ago. But, like the search for Malaysia Flight 370, when a bomber was blown off course by weather, storms or bad navigation, the oceans were so vast that looking in one area -- guessing -- was akin to searching in Colorado for a plane that went down in Florida. Search and rescue then and now is a race against the clock that often comes down to something as simple as eyes on the prize. On the eve of World War II, airplanes were still relatively new. Most were small, under powered affairs that rarely flew over large bodies of water. The great exception was the fleet of flying boats owned and operated by Pan American Airways, but travel was still limited. World War II changed all that quickly. Within a year of Pearl Harbor, large four-engine bombers and agile fighters were so frequently flying over the Atlantic Ocean and across the English Channel that they skies were actually thick with traffic and mid airs were infrequent but nonetheless common. Long gone are seaplane bases like these which were scattered through the Pacific to get to downed airmen faster. Credit: Lost in the Pacific/National Archives. So, too, were ditching’s. Since 1944, more than 400 aircraft have ditched in the Indian or Pacific Oceans, most of them large, intercontinental bombers, and most of them during the later parts of World War II. As with the current mystery of Malaysia Flight 370, finding these WWII planes was not easy. Even after days, weeks or even months of searching, just 40% of the downed crews were ever rescued. Early search and rescue (SAR)[i] came about through a combination of German and British technologies and techniques. Going back to the late 1930s, it was actually the Nazi Germans who first developed a dedicated SAR services and, oddly, they performed their first large scale rescue on a British bomber crew their own fighters had just shot down. The British picked up their techniques and improved on them and it quickly evolved into a multi-layered air-sea rescue capability that relied heavily on radio signal triangulation, radar, and fast boats. However, speed was of the essence. Because of the cold waters and the intense combat that usually preceded a ditching, the average rate of survival for the English Channel was low. As the war moved to the Pacific Ocean , few of the techniques that proved effective over the English Channel panned out in the Pacific. The oceans were simply too vast and the islands were too far apart to make use of radio triangulation. Complicating matters even more, the fronts were moving rapidly as soldiers island hopped up through the Central Pacific. By 1944, thousands of the large B-29 bombers had been moved out to air bases on Guam. Missions were now being flown against Japan itself which was 1,500 miles away, all over water. Owing to a myriad of causes -- fuel exhaustion, mechanical failures, combat damage, weather -- planes were going down to the tune of some 300 plane a year, and oftentimes where they went down was anybody's guess. Like Malaysia Air, success always came down to one thing. When a plane went down, the clock started ticking and it ticked very fast. If it sank, it disappeared and so too did the crew, or so it seemed. Sighting a raft was infinitely harder than a plane (which was hard enough) and the thousands of small islands seemed to hide crews as much as help them. Plus, there were ocean currents and storms. Getting rescue assets on scene as soon as humanly possible was essential to a successful outcome. To quicken their reaction time, rescue crews were pre-positioned across the Pacific via a network of seaplane bases, submarines and surface ships that stretched from Guadalcanal to Tinian Island and nearly to Japan. Because rescue planes were attacked by the enemy, they almost always flew with fighter escorts. Submarines were one of the most effective rescue assets in the Pacific. Credit: Lost in the Pacific/National Archives. Lifeguard submarines and dedicated seaplanes called PBY Catalina’s were two of the most effective rescue assets used in the Pacific and were generally the first responders. As missions were directed against mainland Japan, as many as 20 Catalinas would be in the air along a “rescue line” to and from the targets. Below, in and on the ocean, would be 12 submarines and a like number of ships. To help them survive and be found, downed airmen had considerable resources. Allied airplanes were equipped with emergency radio transmitters called Gibson Girls (because they were curved somewhat like the tiny-waisted girls in the much loved Charles Gibson cartoons), smoke grenades, flares, tracer rounds, mirrors and dye markers. Still, a great many airmen perished after ditching owing to the sheer size of the Pacific. Far East operations recorded a 47% rescue rate. It was not for lack of trying. Unsung in the story of Pacific SAR are the heroics of the rescuers. While attempting an open-water rescue one PBY Catalina seaplane pilot nearly lost his plane and became a survivor himself. Wrote a grateful pilot who was eventually rescued – after 11 days alone: “at 1100, I spotted three Navy Catalina flying boats approaching me. Two passed within half a mile, but failed to see me. The third passed directly overhead and saw the sea marker dye I had spread on the water. “He dropped a smoke bomb to mark my position, called the other planes back, and all three circled the raft. The waves and swells were ten feet high. It would have been a rough sea for any craft, let alone a flying boat. “Two of the planes lowered their retractable wing floats and made an attempt to land. Both pilots decided, upon closer observation of the waves, not to risk "setting down" on such a choppy sea. About that time I drifted into a rail squall and the rescue planes lost sight of me completely. A PBY Catalina with a search and rescue blimp. Credit: Lost in the Pacific/National Archives. “The third pilot, Lieut. (jg) Hamblin, was a little more venturesome than the other. Although he could not see me, he decided that, if one of them did not land on the water in that vicinity, they would probably never find me again. He dropped his depth charges and about 900 gallons of gasoline (I'll bet that breaks your heart) to lighten the plane and made a power-stall landing on the water. His starboard wing float hit a swell as he was landing and started to spin the plane to that side. Hamblin proved to be the master of the situation. Quick as a cat, he hit the throttle on the starboard engine, and kicked the rudder and stick to port. How Vast The Earth. How Small a Jetliner. How Small Is the Boeing 777? Author of Lost in the Pacific, Earth at Night As Seen from Space Identifies Photos of Jetliners as Seen from International Space Station. A jetliner over Green River, Utah. ISS038 – 35416 Caption: A twin-engine jetliner flies through a photograph of the Green River in eastern Utah. L. Douglas Keeney is the author of Lost in the Pacific, Earth at Night as Seen From Space and 15 Minutes: General Curtis Lemay and the Countdown to Nuclear Annihilation. He holds a Masters degree from the University of Southern California. Since 1963, intercontinental nuclear bombers – the largest jets we make – have operated in and out of secret airstrips virtually unnoticed. The disappearance of Malaysia 370 has brought to light things most of us don’t ordinarily think about. For one, the Indian Ocean, and the near absence of any technologies to track objects across its vast reaches. In a time when we’ve come to believe that technology is the answer to almost all of our problems, the Indian Ocean tells us otherwise. “Secret runaways,“ “uninhabited military airfields,” and “hidden landing sites” have been operated by governments and known to have existed around the world since 1963. These airfields have never been on aeronautical charts yet at one time more than 200 of them were operated by the United States alone. Add to that number those operated by the Russians and other governments and the entire topic of secret landing strips becomes oneof the most unusual, untold stories of the modern air age – and one very relevant to Flight 370. More to the point of openness and the search for the lost jetliner, we know we had them, most certainly the Russians had them too, as would any other high functioning military aviation air force such as found in China, Israel, India, or even Pakistan. They were, or are, an essential part of the combat mission folders carried by our nuclear bomber crews. That said, there has been no mention of them since a declassified Strategic Air Command document revealed them in detail in 2009. Here the facts stop, but no doubt there were many hundreds of such areas all suited for aircraft as large as the 777, including secret landing sites across China, Russia, and India. We think again of these hidden landing sites because we have a hijacked airliner still missing. And while the idea of secret airfields has certainly been fictionalized in movies we are reminded by world circumstances that they do exist and that the story of them remains to be told and is in fact not yet over. What we do know is that intercontinental nuclear bombers – the largest jets we make – operated in and out of these secret airstrips virtually unnoticed. Presumably Flight 370 could as well, or land in areas like them. The idea of secret airfields has certainly been fictionalized but in fact it is very real and alternate natural landing sites may now be part of the mystery of Malaysia 370. Either way, the mystery of 370 reminds of other stories yet to be told.